From the creation of fast food, to the design of cities, to the character of our landscape, the automobile has shaped nearly every aspect of modern American life. In fact, the U.S. motor vehicle industry is the largest manufacturing industry in the world. James Rubenstein documents the story of the automotive industry... which despite its power, is an industry constantly struggling to redefine itself and assure its success. Making and Selling Cars: Innovation and Change in the U.S. Automotive Industry shows how this industry made adjustments and fostered innovations in both production and marketing in order to remain a viable force throughout the twentieth-century. 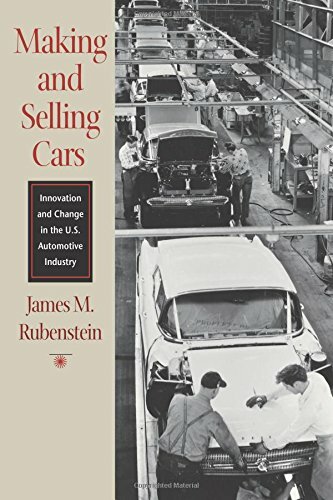 Rubenstein builds his study of the American auto industry with care, taking the reader through this quintessentially modern history of production and consumption. Avoiding jargon while never over simplifying, Rubenstein gives a detailed and straightforward account of both the production and merchandising of cars. We learn how the industry began and about its methods for building cars and the modern American marketplace. Along the way there were many missteps and challenges―the Edsel, the fuel crisis, and the ascendancy of Japanese cars in the 1980s. The industry met these types of problems with new techniques and approaches. To demonstrate this, Rubenstein gives the reader examples of how the auto industry used to work, which he alternates with chapters showing how the industry has reinvented itself. Making and Selling Cars explains why the U.S. automotive industry has been and remains a vigorous shaper of the American economy.